Is West Bend Planning to Build a School For Germantown Kids? The plans for a New Jackson Elementary School in the West Bend School District call to build a new and much larger school building. The School Board has already purchased property to the south of the current school. Here’s the thing… Jackson Elementary already sits in the extreme southern part of the district. The new site moves it further south. Why? And why build a bigger building when enrollment is declining? As you can see, the site of the proposed new school is less than a mile from the Germantown School District and just about a mile from the Slinger District. The question becomes, where will the population growth be? If the population growth is going to be to the north of the village, then it would make more sense to site the new school further north. Due to the Jackson Marsh and the underground pipeline to the east of town, nobody really expects growth that way. 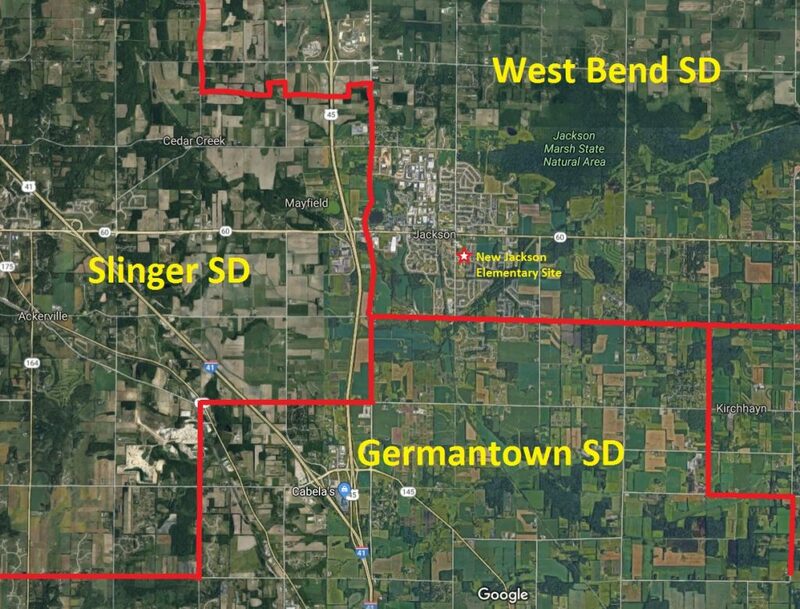 The most likely areas for growth are to the West, in the Slinger District, or to the South, in the Germantown District. Fortunately, we don’t even have to speculate too much. The Village of Jackson has approved a handful of new subdivisions. You can see the map here. One of those subdivisions is a 20 acre plat on the south side of town in the Germantown School District. Incidentally, Joel Ongert, the West Bend School Board President, and Don Kirkegaard, the West Bend School Superintendent, attended the Village Board meeting where that subdivision was approved. This is just what the Village of Jackson has approved. I don’t know what Mayfield, Slinger, Germantown, and Richfield have planned for their pieces of this map. 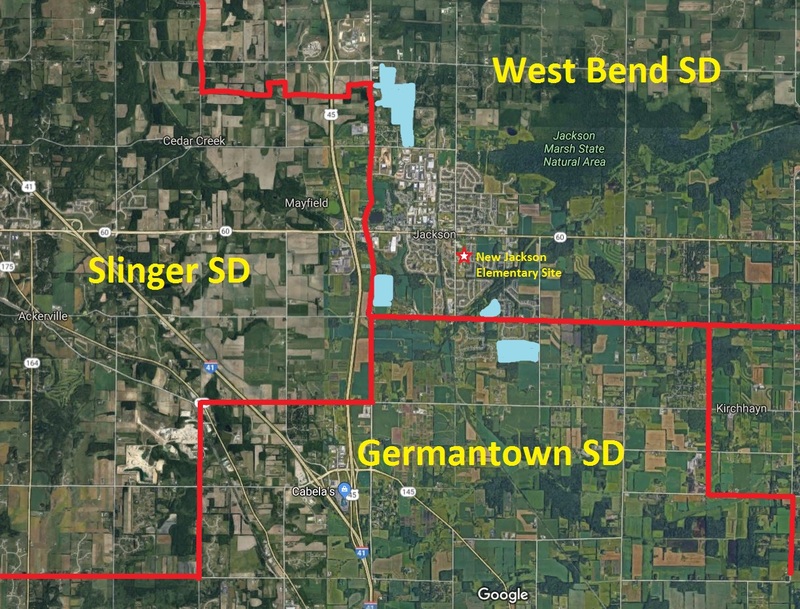 So the question remains… why does the West Bend School Board want to build a massive new school on the extreme southern boundary of the district? Is it to serve the kids currently living in the district or the ones who will move into the district? Or is the big new school designed to lure kids from the Germantown and Slinger Districts through Open Enrollment? We know that the West Bend School District has been a loser in the Open Enrollment battles for years. Is this school designed to stop that bleeding? If so, why should the taxpayers of the West Bend School District shoulder the burden of building a fancy new school to serve kids who live in another district? IF the taxpayers are going to build a new school to serve their own kids, why not build it on the north side of town – further inside the district and closer to the potential growth around PV? There has been a lot that doesn’t add up about the why, where, and how for the School Board’s push for a huge new school in Jackson. Perhaps the cartography answers some of those questions – even if they don’t want to say it out loud.